Second hand and used Saws for sale. All of the top items on the best UK second hand classified and auction sites in one place. 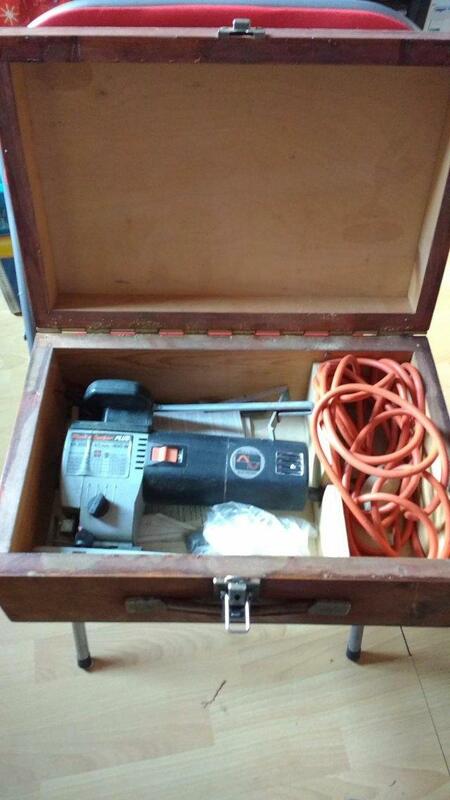 Scroll saw in box great condition really handy tool doing jobs around the house says what it does on the box . 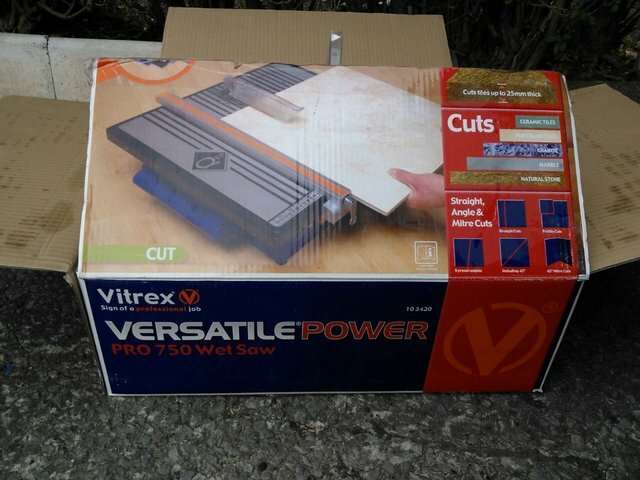 Vitrex PRO 750W Wet Tile Saw 240V Purchased new for a one off job. Includes attached blade. Used for a total of 4 hours. CIRCULAR SAW, 1200 WATT, ADJUSTABLE FENCE AND BASE PLATE. 2 1/2 INCH CUT DEPTH. HANDBOOK AND TOOLS. Parkside Corded PTS 500 A1 Plunge Saw. Mains electric in neat carry case containing plunge saw, allen key, adjustable guide side bar, vacuum attachment, 2 saw blades and diamond-coated cutting blade,. 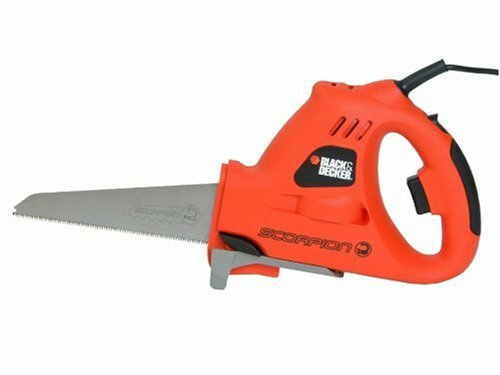 BLACKSPUR 28" ( 700mm) TUNGSTEN CARBIDE MASONRY SAW. 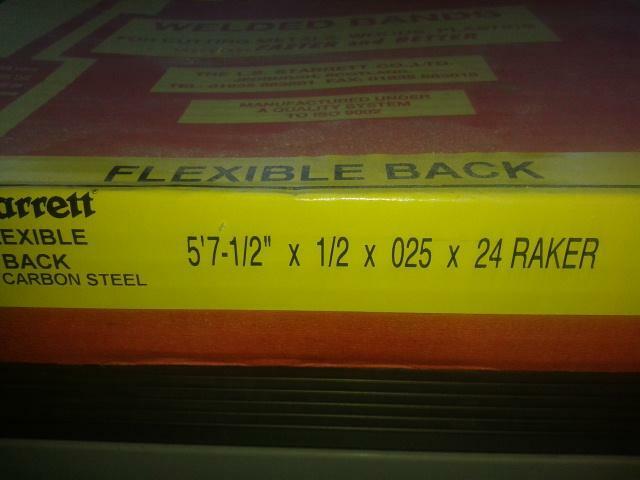 HAS ONLY CUT 7 X 4" THERMALITE BLOCKS.AS GOOD AS NEW CAN DELIVER FAIRLY LOCALLY FOR SMALL FEE. For sale a Black & decker electric saw ( scorpion ), sorry no instructions with it or other bits. Still in good working order. Selling due to I don?t use it. Thanks. Black And Decker Circular Saw. Condition is Used. Dispatched with Other Courier 3 days. Made by Black Forge. Good used condition with paperwork. Buyer collect or p&p extra. Wadkin Bursgreen 12BGP panel saw The Wadkin panel saw was in very good working condition when placed in storage a few years ago after a workshop change. With the plan to reuse again but now no longer. Power saw with two spare blades. Good working order. Pro line mitre saw on an Axminster stand. Stand folds up for easy storage. Good condition. Had very little use. Electra Beckum (Metabo) KGS 303 sliding compound mitre saw including stand and extraction kit along with three additional Axcaliber saw blades (hardly used). Saw is in excellent condition and cost in. Challenge Xtreme circular saw. Used twice. Collection only. Used electric Performance Power jig saw. Bosch 240v reciprocal saw, used but In good working order, no damage to cable or body, comes with 3 spare blades for cutting wood and metal. Hitachi Reciprocating Saber Saw CR13VA 110v. In very good condition, has been little used. Comes with in plastic storage case and a selection of new blades. Stihl saw ts400, good compression and cuts well. On off switch doesn?t work so I use the decompression valve to shut it off and the fuel needs to be kept topped up as it cuts out at half a tank, it?s. Evolution circular saw, 240v, Like new, comes with blade suitable for cutting wood, plastic, aluminium and steel. Dremel Moto-Saw 2in1 scroll saw. Never been out of box, never used. Collection only. Unused TCT 40teeth blade 250x30mm bore. Medium cut. General purpose. Suitable for hard and soft wood, veneered and laminated boards. Reduction rings included. Performance Power Tools Radial arm/compound mitre saw in good working condition.Buyer to collect. Dewalt cut off saw . 110v. In good working condition . Weighs 19.2kg Owner now retired from fitting . other tools available on request . Collect only . No time wasters . Compound Mitre Saw 1200 watts 210 mm Blade. Condition is Used. Collection in person only. Meddings Jig/Scroll Saw. Smooth and Powerful Machine. 400V 3-phase Supply (5-pin plug). With 600mm/2ft Throat. Just been professionally wired (with New Start/Stop Buttons). Can be seen running in our. Good condition and in good working order. Includes brand new diamond wheel. pics for rotosaw. 1950's vintage saw. 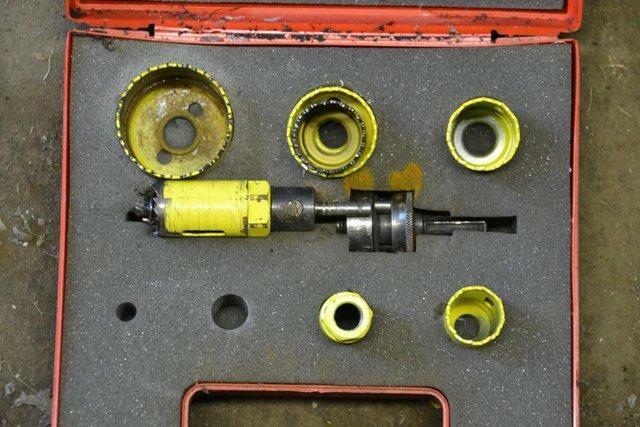 Works by attaching drill to it. this is a B&Q circular saw used in working order needs a new blade circular saw. Condition is Used. Dispatched with Royal Mail 2nd Class. 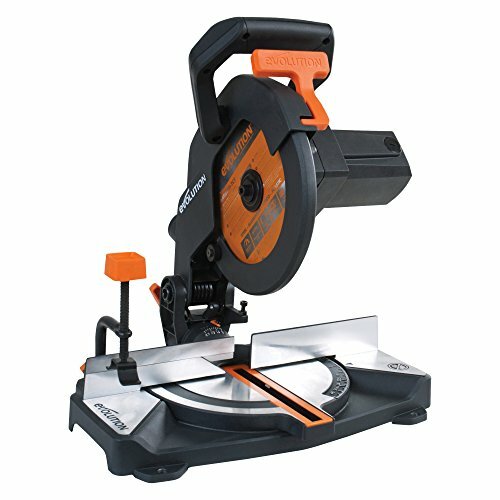 JBC 1400W Circular Saw . Condition is Used. Dispatched with Royal Mail 2nd Class. Vintage Black-Decker 7308 circular saw,see box for more information. DeWalt dw720 radial arm saw . 15" cross cut . Good condition. Saw, used but can still be used. Please note: I will not sell to anyone under 18. Collection only. Jet table saw and stand.Have all attachments,guard,riving knife and mitre fence. Comes with three brand new carbide tipped blades. Bosch Circular Saw good condition for sale due to retirement. makita 5704R circular saw 240v . Condition is Used. Surpluses requirements as got battery one. Collection in person only. One Table saw for sale. Very good condition and only used a handful of times. Buyer must collect this. 127mm ( 5 inch ) hole saw and harbour. used once. all teeth intact and sharp. Electric used jig saw in carrying case. Circular saw, 240 volt 7" blade 45deg tilt,In working order.Any questions please ask.Thanks for looking. 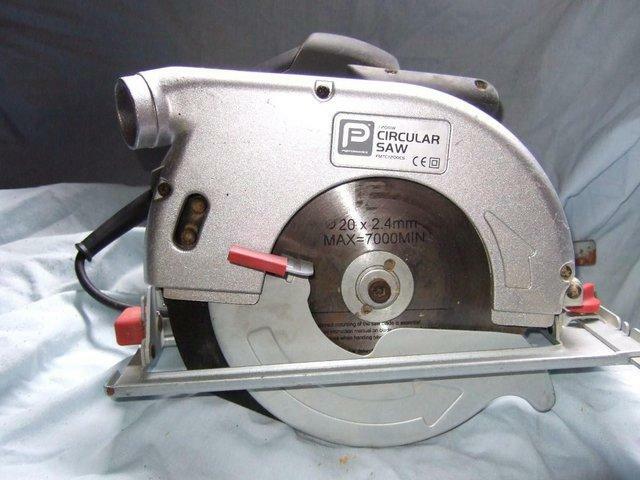 Erbauer circular saw 1500 W, 190mm x 030mm - Only used once. Condition is Used. Dispatched with eBay delivery – Shutl 1 day. Dremel DSM20 compact saw. Comes in case with cutting discs and accessories. Excellent condition, hardly used. Collection only.